A while back, I downloaded a free app named "human". The app runs silently on your iPhone and tracks your daily activity. The goal of each day is to be in motion (walking, running, etc.) for at least 30 minutes every day. Many "fitness" fanatics suggest that everyone should exercise for at least 30 minutes a day. I'm not sure if the point of the app is to help you reach that goal through your normal daily activities (not terribly effective) or to help people realize that their daily activity is not enough to keep them healthy. The first day I used the app. I woke up knowing I had a pretty busy day so I was confident I would knock out my 30 minutes easily... Probably by lunch. That night at 10:30 when I checked the app, I was devastated to discover I had only accumulated 28 minutes of physical activity. Ugh. Slowly the reality set in... My daily routine is simply not enough to keep me healthy. I need to block off time every day to pay attention to my physical health. And then I realized I had a sermon. Many Christians live as if an hour in church is all that is required for spiritual health. They live their daily routines (perhaps pausing to pray for a meal) believing that their life's routine is sufficient to sustain their faith. Truth is... Your daily routine is simply not enough to keep you healthy. You must figure out how to block off time every day to pay attention to your spiritual health. 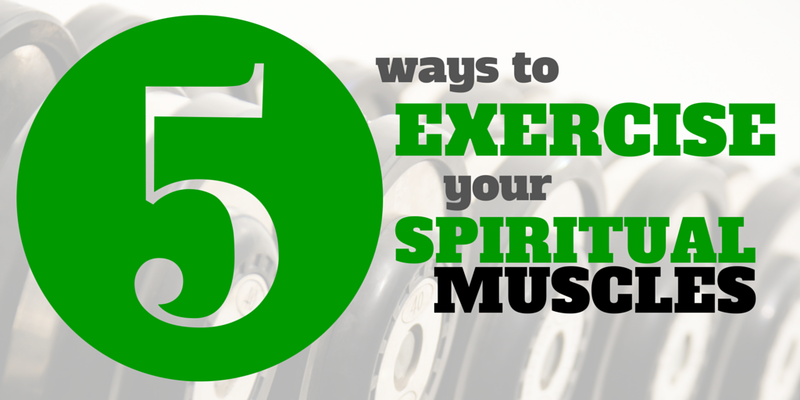 Exercising your spiritual muscles doesn't have to be intense. Here are five simple things you can do to exercise your spiritual muscles. Listen to a sermon. Download it, get a DVD, subscribe to a podcast. Sit in creation. Find a quiet place, sit down, look around, and think of all the things in your life for which you can be thankful to God. Read a Proverb. Reading any part of the Bible will contribute to your spiritual health. Proverbs are powerfully insightful and practical. If you can read and apply them regularly, they will significantly increase your spiritual health.